Albert Einstein, who revolutionized physics, is considered one of the greatest thinkers of history. Today, his name is synonymous with Genius. Even though he was ambidextrous, he wrote with his right hand and I was lucky enough to find good prints of his hands, especially a clear one of his right hand. The first thing that caught my attention was the shortness of his fingers. Until then – quite a few years ago – I had wrongly assumed that thinkers had long fingers, like Abraham Lincoln for instance. I had forgotten that many are very intuitive, and their thinking process is extremely fast. This is the case of Albert Einstein. The short fingers accelerate the thinking and allow him to connect ideas from different domains – such as energy, time and space – to create results. The big and round mount of Luna is full of good ideas and it is well balanced in height and in width, so that those ideas are brought to bear. Just like other geniuses – e.g. Pablo Picasso - he has a strong thumb, a large mount of Venus and a long head line. The strong thumb allows him to control his environment without letting anything stop his determination, not even a World War. The large mount of Venus provides the enthusiasm and vitality required to keep doing the mental work. The long head line acts like a laser beam, leaving the world behind and extending the realm of the possible. The fact that it is uninterrupted and curved gives even more power and flexibility to the mind. The origin of the head line is separated from the life line, endowing him with carefree and independent thinking, sometimes disregarding the feelings of close ones. For instance, his second marriage – to Elsa Lowenthal – was based on convenience more than love. The head line goes down on the mount of Luna, the world of imagination where he spent a lot of his time, disconnecting himself from the mundane life and therefore acting like a typical “absent-minded professor!” This also confirms that many of his ideas came through intuition as opposed to deep analysis. 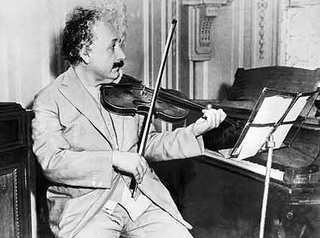 Reportedly, when he was trying to solve a problem, he would play the violin and wait for inspiration. And it would eventually come! There is a clearly marked square on the mount of Jupiter. 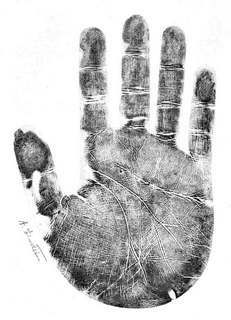 Depending on the palmistry school, this sing either means a teaching ability or a tendency to attract relationships with people from other countries. In Einstein’s case, both seem to apply since he has lived in different countries (Germany, Switzerland, United States) and was a university professor. Ketu, the mount at the bottom center of the hand, rarely appears on a print. However its large size made it visible on Albert Einstein’s print. It reveals what happened before someone’s birth. 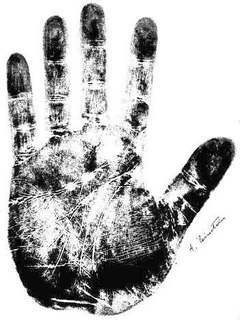 In the case, the long and straight destiny line of focused activity starts from a big Ketu and crosses the whole hand. 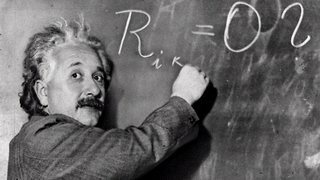 It seems that, when he was born or even before, Albert Einstein already knew he would be a genius, even his amazing talent only became apparent in his teen years.